It starts with one! The fifth Earth Hour celebration in the Philippines takes it to the next level. (SPOT.ph) Did you know that for the past four years, the Philippines has been the top participant for Earth Hour and we the participating citizens have helped earn it the title Hero Country? That’s right, we’re number one. One doesn’t seem to be the loneliest number when put that way and one is all you need to help reduce the damage that dear old Mother Earth has been sustaining. 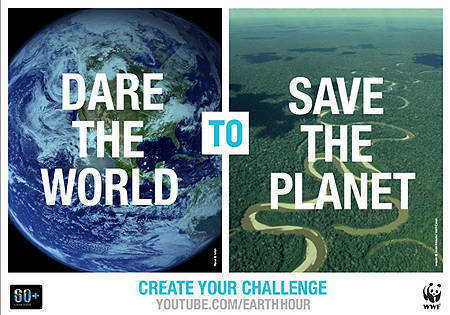 This year on March 23 at 8:30 p.m., WWF-Philippines is hoping that the streak doesn’t break and that more people will take on their "Dare to Save the Planet" through the "I Will If You Will" campaign. The "I Will If You Will" campaign was launched in 2012, breaking the simple tradition of merely switching the lights off for an hour. The core idea of Earth Hour is doing something as small as spending sixty minutes in the dark to reduce the use of resources, in this case electricity, and raise awareness on climate change issues. This time, people are volunteering to make pledges or do wacky dares if people will do little things to save the planet. Although done in good will, Earth Hour has not escaped criticism from several groups, including accusations of being a purely symbolic act that does not achieve its goal of helping the planet. In 2008, Peter Gorrie of The Star asked the question "Where do we go from here?" WWF humbly answers, "We go to the Internet." This is perhaps also a response to groups accusing them of being anti-technology or that Earth Hour devalues the technological advances the human race has made. Maybe WWF’s move to increase online visibility is their discreet way of saying, "We don’t hate technology, we’re just pushing for sustainability." This year, WWF-Philippines National Ambassador Marc Nelson is encouraging people to not just reduce electricity consumption, he’s encouraging people to start using tumblers instead of plastic bottles. His fellow National Ambassador Rovilson Fernandez has pledged to conduct a free CrossFit class (in spandex!) if 1000 people start using reusable grocery bags instead of plastic bags. Mikee Cojuangco-Jaworski, Climate Solutions Steward, pledges to donate 500 citrus seedlings to the Abuan Watershed if 500 people will agree to quit smoking for 5 days. And it’s not just individuals. Companies like Big Chill, Philips, Subaru, and Starbucks are making their own pledges if people take up their challenge. For their pledge, the LBC Foundation will donate 500 trash cans for public use if 500 people will return used pouches to LBC branches. The basic idea of Earth Hour is still to avoid the glitz and glam and if you can’t find a challenge that you want to pledge yourself to, remember that there’s 8765 or so hours in a year. That’s a lot of time to do little things. Use a rag instead of a tissue to wipe a spill, ask the baggers at the convenience store or grocery not to put your small purchase in a plastic bag anymore, or have quicker showers to reduce water consumption. For the actual Earth Hour, do something that really counts like just sit there in the dark. Don’t light up candles (they use up energy to make), switch off your mobile phones (switch everything off! ), and don’t go around driving (hello, gas?). The naysayers say that it’s only symbolic but what’s wrong with that? Yes, sit in the dark for an hour and really just sit there. Depriving yourself of the great advances we’ve made through the centuries, if only for an hour, might motivate you to start living a more sustainable lifestyle. 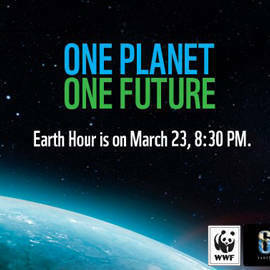 For more information on the Earth Hour and WWF-Philippines, visit their website, their Twitter account, and their Facebook page.